Welcome to the pixelated world of Arcader! This is an excellent video slot game from the world's most popular software developer, Thunderkick. You get the chance to travel back in the old days of retro technology in this five reel with three rows and 15 pay lines slot. Thunderkick has used modern technology to create stunning 3D reels and different features and symbols like the free spins, wild and bonus games to increase your chances of hitting the jackpot of $2000. Arcader slot features an engaging soundtrack and robotic sound effects when you land a win. Like other Thunderkick video slots, this slot is offered in free play mode and real money versions. If you lived in the Arcade era, the days of coin operated machine games like Asteroids, Donkey Kong or Space Invaders, then you will appreciate the efforts Thunderkick has used to create this classic themed slot. Besides the great visuals and flawless gameplay, you will enjoy a pocket friendly betting range of 20p up to $100 per spin. With a theoretical return to player of 96.1% is and a maximum win of up to 160000 coins in a single spin. Enjoy this exciting retro style video slot on your Android or iOS powered smartphones and tablets on the go or when relaxing on your couch from anywhere. 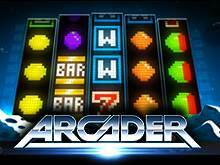 It is evident that Arcader slot game is inspired by the traditional coin-op fruit machine games that were common in brick and mortar casinos in the 70s and 80s. As the slot loads, you will be teleported to a virtual space world. The reels are set against black space, and there is an excellent view of the three-dimensional galaxies. What's interesting is that this slot game attracts both the young and old. 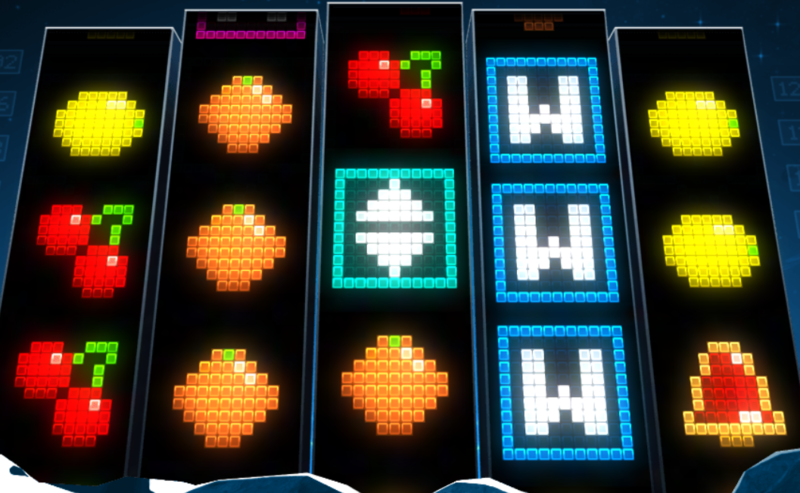 The symbols of the game such as the Lemons, Cherries, bells, and Bars are created with the blocky graphics to blend with the arcade theme. Other than the attractive appearance, you will be accompanied by a perfect sound effect that will brick back all your childhood memories and keeping you immersed and entertained all through. You will hear alien sounds effects such as gun shooting, a high pitch, and a robotic voice, "You Win." Thunderkick understands that everyone needs that motivation voice while playing, and that has been achieved in Arcader video slot. Being a classic themed video slot, you expect to find simple and straightforward gameplay. Thunderkick has achieved this in the game and even much more. You will play on a standard layout of 5 reels with three rows and 15 fixed win lines that pay from the left to the right reel. There are different classic fruit machine symbols which are grouped in low value and high value. The Bar, 7 and a Bell represents the high value symbols that pay out up to 2000 coins. The little value symbols include the orange, a lemon, watermelon, plum and cherries with payouts of up to 900 coins with the maximum bet value. Also, there are additional special bonus symbols such as the standard Wild "W," the Bonus Game "B," the Stick Wild "Green W" and the Mystery Game "M." If you are lucky, you may also land an Expansion symbol that can occupy the whole reel with the best paying symbols. Once the slot has loaded, click on the Spin button in the bottom right corner. The slot's default bet is set to $1.00, but you can adjust the bet value by clicking on the poker chip icon. There is an autoplay button in between the spin and the chip icons. This will allow you to select up to 5000 spins. Click on the dotted symbol in the bottom left of the corner to access the game's rules and additional information about the payouts and how to activate the bonus features. Arcader slot is packed with different symbols and special features. There are eight base symbols and additional special. In this section, we will look at the payouts offered by various elements and symbols in the slot. The wild symbol is represented by the blue "W" and can substitute all other symbols in the game except the bonus symbol, the mystery symbol, and the expander. The Expander is marked by a turquoise box and up/down arrows. It will expand the reels it appears on with the symbol representing the best possible pay line. You will get one sticky wild chance on the three central reels with every free spin. The sticky wilds will remain sticky throughout the bonus game. This symbol substitutes all other symbols in the bonus game, and the green "W represents it." Collect mystery wins until a blank is hit or until all mystery wins are collected. Thunderkick's mobile slot games are exciting to play as they come with stunning graphics and animations as well as numerous symbols and features. This is what you get when you play Arcader video slot on your smartphone or tablet. The game is built with advanced technology like HTML5 which enable it to maintain a seamless play on Android and iOS devices. Arcader slot is available in instant play mode only, meaning you don't have to worry about downloading any software on your mobile or desktop. You can play it directly via any mobile browser such as Chrome, Safari, and Opera. Thundekick is a Swedish based online slots game developing company that was established in 2012. It has earned a good name in the gambling world for releasing slots with original themes and rewarding features. Thunderkick slots are available in instant play mode, and you can find them listed on recognized casino sites in the UK. Unlike other developers, Thunderkick only creates online slot games including the video slots, 3D slots, classic slots, and the fruit machine games. You can play all their slots on smartphones, tablets, and desktops either for fun or real money.